This post is the second in a series where I will be breaking down the vocal effects used on the lead vocal in my mix of the song “Treasure Hunting” by Sarah Emerson (http://www.sarahemersonmusic.com). 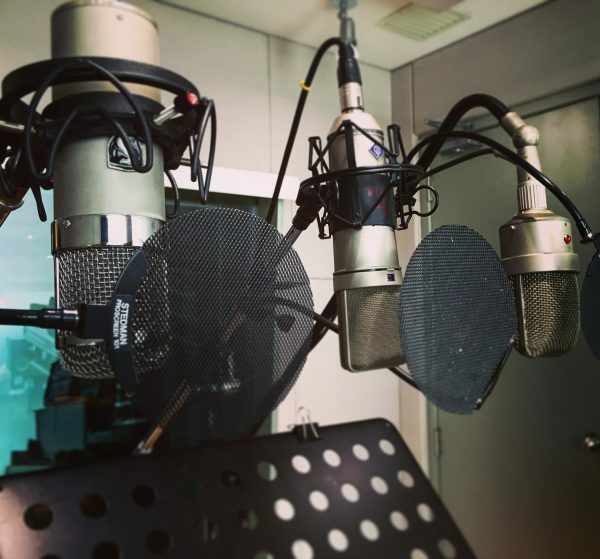 This post covers the first pre-chorus section and first chorus, to learn about the effects that have already been established in the song prior to this check out the first post Vocal Effects in a pop mix (part 1) ! So first, just a quick note about a change that happens to the existing effects as we come into the first pre chorus. To make room for some background vocals and these additional effects, i automated my reverb send for the EMT 140 plate reverb down about 4db (This verb is the main vocal verb that appears throughout most of the song). This automation was done with the mouse, and I didn’t spend much time thinking about the numbers, i just wanted it down enough to make room for the new effects, and not have the vocals get too washy in the chorus. 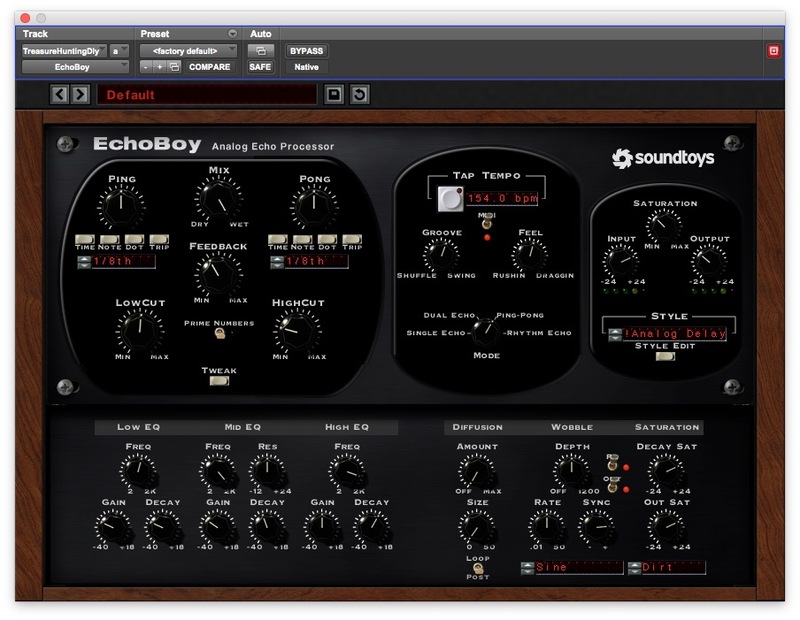 The first additional effect added to this pre-chorus section is another instance of SoundToys Echo Boy. This delay is pretty loud in the song, and ping-pong’s between 1/8 and 1/4 on the left and right sides. The effect adds some slightly chaotic energy to the pre-chorus, as well as additional stereo width. I feel it adds a bit of tension and excitement to this section since it has a quite a bit of feedback and is ping-ponging left and right. For me, this effect sets the listener up for the chorus, since it introduces more stereo activity. It bridges the gap between the verse and chorus in terms of width and really helps build the song in general. I’m also adding some volume automation on this effects send, boosting it for the sentence before the first chorus to really PUSH into the chorus, by enhancing the delay slightly before the chorus section. Style – FM Radio with Saturation turned up and Input turned up – The FM Radio preset gives a mid range filtered sound that cuts through the mix. The saturation and extra input into the effect gives a bit of compression to the effect, making the feedback repeats much more pronounced and a little more distorted or “saturated”. As i’ve said before, you really have to spend time with these settings to understand how they effect the sound. I usually audition many of the settings before deciding on what to use for each instance of this plugin. So next, we have a new reverb that creeps up in volume slowly from the start of the pre-chorus, and finally builds into the chorus at full volume. This Altiverb preset is modelling the famous AMX RMX16 reverb unit set to Hall with a decay of 6 seconds. I’ll admit, this chain is a bit convoluted… after the AMS reverb, i have an H-comp doing a lot of gain reduction, followed by Sound Toys Filter Freak plugin, and finally a waves R-EQ. The point of this chain is to add a reverb that is really big and “EPIC!” sounding, but also is pumping in time with the music when I want it to (this is controlled by automation on the Filter Freak’s “MIX” control). I use this automation on the Filter Freak plugin to build energy leading into the choruses of the song, and in a few other spots during the song. This gives a subtle feeling of a 1/4 note pulse, but BEFORE the 4 on the floor kick starts in the chorus. It adds motion without being too obvious (except at points in the song where I turn the reverb track up and mix on the filter freak way up to showcase the effect and add drama to the mix). Type – Hall C1 preset with a 6 second decay. Altiverb EQ – taking out 2 dB @ 3.6kHz, and boosting 5.2 dB at 10kHz. The cut at 3.6kHz is taking out a tiny bit of harshness and the 10k boost is adding a bit more sparkle or space. The point of this compressor is to make the reverb feel a bit “squished” by changing the attack and decay of the verb. As well, this compressor allows me to push into the reverb from the track send more without worry about the verb getting too loud. The compressor also doesn’t make the verb any longer, but it makes the decay less linear, so you can hear more of the tail of the reverb and it makes it feel a bit longer. This makes it feel less natural since it doesn’t decay in a “normal” way, adding to the surreal sort of feeling I am going for. Analog- Off. I just wanted this compressor to control volume, i didn’t feel the need to add any more “character” or EQ changes with the compressor. Ratio – 8:1 – I wanted to it to be heavy handed, so i picked a higher ratio. Attack 15ms Release 279ms – I wanted a fairly slow release, and not too grabby on the attack but not too fast. This compressor is supposed to make the reverb sound a bit squished, and also make it feel longer by changing the release. I wasn’t worried about it being transparent, since its more of an effect. Mix – I initially set the compressor up and liked the effect, but thought maybe I took it too far, so by setting the mix knob to 80 percent I am adding in some of the dry uncompressed signal and making the effect slightly less drastic. This plugin is doing something very similar to what a side-chained compressor would sound like with the release timed with the music, but it is taking out frequencies only above a set threshold with a low pass filter (LPF), and is being trigger by the tempo. Normally this sort of effect would be ducking all of the frequencies, and be trigged by a kick drum or another element in the song. The goal with this plugin in this situation is to make the long hall verb i’ve setup pump or “breathe” in time with the track. This adds another layer of motion to the song without being too obvious, and is one of the many things in the mix that helps propel things forward and add energy. Shape – LPF (low pass filter) This sets the shape of the filter that the plugin is using, it is set to LPF because I want the high frequencies to be filtered out only. Frequency – This sets the lowest frequency that the filter goes down to. If it was set to 20kHz there would be no filtering. It is set to around 300hz so the very bottom of the verb always stays, but the top end pumps only. Poles – This adjusts how steep the LPF i’ve set is. each “pole” is a 6db/octave slope. So 2 Pole is a 12dB per octave filter. Tempo – Midi Sync on – This sets the plugin to sync to protools tempo. Rhythm – I’ve set the Filter Freak to trigger based on rhythm. And set this to 1/2 note, but it’s actually 1/4 note I think the songs tempo wasn’t set right. Either way, i just adjusted it by ear until the rhythm was what I wanted. So this eq is just here to give a little bit of final shape to this verb. I felt it needed a slight boost around 4k for some more presence, and a few dips around 200-300 hz to take out some mud. As well as a HPF at 90Hz (this was probably unnecessary). I initially had the original ping pong delay that was introduced in pre-chorus 1 stay in for the entire chorus, which it still does, except when Sarah says “We’re treasure hunting”. I wanted to treat this section of the vocal a little differently as I felt the original delay didn’t feel right with it. So in the chorus the delay throws (or sends) alternate between our orignal ping pong delay and this new one every time the line “Were treasure hunting” is sung. **Note: All the extra settings at the bottom of this picture are what show up when you press “Style Edit” on the right hand side of the Echo Boy plugin. I’m not going to go into detail with those plugins, but I did tweak many of the “gain” and “decay” settings on the bottom left side to achieve the sound I was after. Delay Times – Ping and Pong delay times set to the same value. This is because i still wanted it to ping and then pong left and right but i wanted them to be the same delay time. Feedback – Set to 11o’ clock. This setting was tweaked after i had the STYLE section setup since the style saturation can effect how the feedbacks sound. 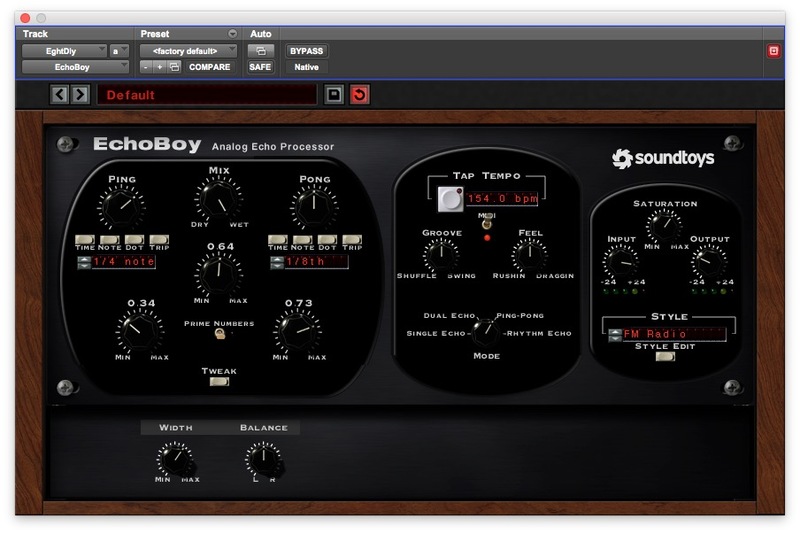 Style – Analog Delay with the saturation turned up, as well as many of the Style parameters tweaked. By adjusting the decay and gain settings in the “Style edit” menu you can create some very interesting effects. This could end up being an entire other blog post- so not going into anymore detail for now. So there’s Pre Chorus 1 and Chorus 1 ! If anyone has any questions leave a comment! Or if you have any similar tricks you like to do let me know! i’ll be posting part 3 which will show what happens in verse 2. Keep an eye out for it! Copyright © 2017 Josh G. Bowman. All Rights Reserved.